From welfare mother to New York Times best-selling author, from the Brooklyn projects to Emmy® Award winner, from broken pieces to peace, Iyanla Vanzant is one of the country’s most celebrated writers and public speakers, and she’s among the most influential, socially engaged, and acclaimed spiritual life coaches of our time. A woman of passion, vision, and purpose, Iyanla embodies a no-nonsense approach in her message and teaching style. Outspoken, fiery, transparent, truthful, and wise, she is living testament to the value in life’s valleys and the power of acts of faith. 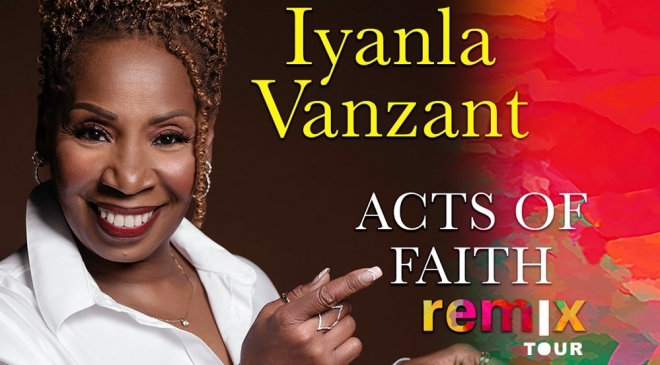 On stage, as she tours the country, Iyanla uses humor and straight talk to deliver her consistent message of love, forgiveness and living your best life. Today, Iyanla is the host and executive producer of the award-winning breakout hit “Iyanla: Fix My Life,” the No. 1 reality show on OWN: Oprah Winfrey Network.